Hyon Gyon creates works focused around unidentifiable ghosts and monsters which are “neither human nor completed motifs.” His works are vibrant and all-encompassing, creating drama and curiosity. 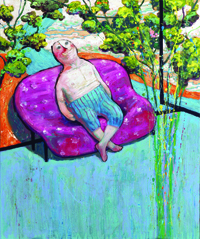 Gyon describes how his paintings act as an “arena where indescribable emotions, such as sadness, happiness, and pleasure are harmonized with one another.” There is an overwhelming energy from his works that drives their emotional power from the vague blown out faces to the vastness of colored foreground. Gyon’s faces are symbolic of a form of destiny—a representation of natural disasters and events that cause life, death and everything in between. They portray the notion that art can be endlessly powerless, for humans cannot go against the face of destiny. But the chaos and hardship in front of us is not a complete darkness—sometimes it is simply a mask in front of a new face. Hyon Gyon is a native Korean artist studying and working in Asia. In 2011 he received his Ph.D from the Kyoto City University of Arts. 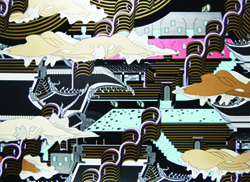 Gyon has exhibited his works in countries such as Korea, Japan, China, and the United States. His work has been on display in both group and solo exhibitions most recently in Seoul and San Francisco. In 2012 Gyon received the Kyoto City Special Bounty of Art and Culture Fellowship. Kiseok Kim is a contemporary Korean artist whose works focus on the inner melancholy and obsession of humans in obtaining a private space within the ever complicated and systematic modern world. Kim’s works are abstract, multi-dimensional, and colorful with textures and juxtapositions that stimulate the mind with contrasting insights and feelings. In some ways there is a sense of minimalism in his works—some people are depicted with missing faces, others with indistinct body forms, allowing the viewer to connect on an empathetic level. 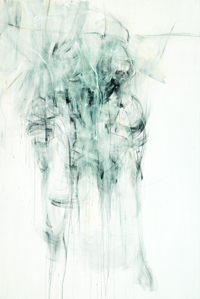 Yet Kim’s works are also encompassed by a sense of complexity with stylistic techniques such as plaint splattering in the background, simulating the chaos of modern society. Kiseok Kim is an artist living and working in Seoul, Korea. He obtained a Bachelor’s of Science degree in mechanical design & product engineering from Konkuk University and a Masters of Engineering in mechanical engineering from the Graduate School of Korea University. Kim has exhibited his works since 2008 in galleries and museums primarily located in Seoul. He has had solo exhibitions in Ewho Gallery, Gallery ON, and EDA Gallery. Kim has recently exhibited his works in a group exhibition at the Able Fine Art Gallery in Seoul. Casper Kang creates one-of-a-kind pieces that are multi-dimensional, holographic, and saturated in color. He typically uses unusual color shades from the full spectrum from white to black, as well as metallic shades to ensure a plethora of visual interest. Kang has a unique abstract style of art that places emphasis on lines and shapes as well as distinct borders to segregate the components in each art work. In many of his works there are geometric patterns and various types of angles created that collide among one another, symbolic of the chaos in modern society. There is boldness and sharpness to Kang’s pieces sometimes holds a semblance to a city labyrinth where one geometric form of art obstructs another. In his “Starless Sky” series, Kang plays with the beautiful dimensionality of holographic and reflective media. Casper Kang is a Canadian born artist of Korean descent. He obtained his Bachelor’s degree from Carleton University School of Architecture in Ottawa. Kang has exhibited his works in group exhibitions, solo exhibitions, and art fairs in Korea, New Caledonia, and China. He has worked in design since 2004 and has also participated in several artist collaborations including the Absolut Vodka Korea Artist Collaboration in 2012. Byung Hee Sung is an artist who delves into the warm-hearted side of pain and suffering in human beings. She creates pieces that depict humans with “anxiety-stricken” eyes but otherwise emotionless faces—a certain emptiness or void. Sung’s works are very specific and detailed with an artistic expression that intends to trigger emotional responses. There is certain intensity in her portraits from the contrast between vivid and dull colors: pale, almost white skin and saturated red eyes. There is a sense of juxtaposition in Sung’s works from the stark contrast in color that touches on two extremes of the color profile. Sung’s dramatically oversized white faces are highly symbolic, referencing fear, exhaustion, or loneliness in a person’s life—perhaps acting like a clown’s made-up mask. For Sung, Every work of art tends to mirror the person who sees it. The interpretation of the meaning in the art text, therefore, is always open to the spectators. Byung Hee Sung received her Bachelor’s degree studying fine art from Hongik University. Since 1992, she has exhibited her work in both group and solo exhibitions primarily in Seoul. Her solo exhibitions have showcased her collections inspired by the suffering of humans with titles such as “The people of this land,” “Survival,” and most recently, “Look into,” showcased at Gallery Biim. Inhee Yang’s work is soft, intricate, and blurred, showing facets of delicateness and subtlety. Her collection titled “Paralysis” is aptly named, for her paintings show intersecting points of space within endless visual layers—the artistic expression is pronounced through planes of depth. Yang’s works emerge not concrete or well defined but as organic and natural figures with soft edges and few details. She envisions the subject and diffuses its structure into thin layers before painting her conceptual image. 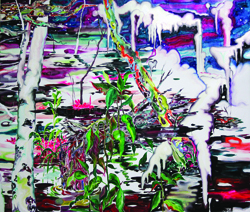 There is a sense of peace and harmony that encompasses Yang’s works but with an undeniable tension brewing beneath the surface—like the “still and quiet surface of water that is about to erupt.” For Yang, the use of gray in her paintings is a reference to a “loss of senses,” existing between the conscious and subconscious. There exists no fiction in her works but a complex understanding of the mind and world. 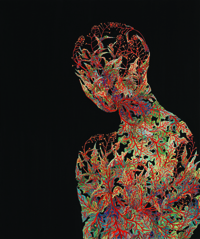 Inhee Yang is a Korean born artist who obtained her Bachelor’s Degree in Fine Art from Kyung hee University in Seoul. She continued her studies at Tsinghua University in Beijing to obtain her Master’s in Fine Art. While studying at Tsinghua, Yang also completed a residency program at the Beijing 5th term of Artists-in-Residence. Yang has held solo and group exhibitions in Korea and China. Her most recent collection of works titled “Paralysis” was on display at Gallery Lamer in Seoul. Minwoo Sung, an accomplished Korean artist, creates powerful, abstract works that delve into the imaginative inner self. Her collection of works focuses on the difficulties of relationships and the notions of loneliness and solitude that humans endure. In her paintings, Sung glorifies the human silhouette, a featureless yet distinct profile. 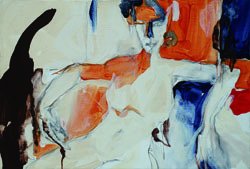 Through the use of color and metaphorical language, her figures are unequivocally human, evoking a sense of inner beauty. Sung paints her figures as emotional beings—they grace the canvas in postures that suggest certain moods. In some of her works they envelop the space with confidence while in others they shy to the side, partially obscured by the borders of darkness. Minwoo Sung is an artist currently based in Korea. She received both her Bachelor’s and Master’s Degree in Fine Art studying oriental painting at Hong-ik University. In 2012 Sung received her Ph.D. in art education at the Korea National University of Education where she studied the identity of Korean painting in the world of contemporary arts. Since 2002, Sung has shown her works in both solo and group exhibitions in Korea, France, Japan, and China. Her works have frequently been on display in galleries, museums, art fairs, and expositions. 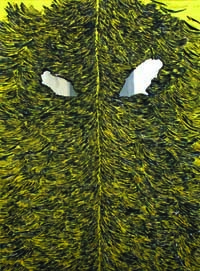 Sung’s latest solo exhibition, “The Grass Garden,” was shown at Hwabong Gallery of Seoul in 2012. Ipkyu Jang is an artist who works primarily in the field of photography through the manipulation of photographs. Jang creates intriguing, powerful, and insightful pieces that prompt the viewer to think twice about one’s own perception. 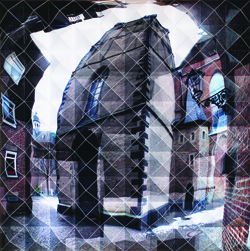 The subjects of his work are connected by individual photographs, each taken from a different perspective so that the reality of the subject becomes distorted. For Jang, he intends to portray how “Every human perceives reality in a different way.” Most of Jang’s works are multi-dimensional with images arranged onto a surface in a way that protrudes outwards. Upon closer inspection, one can see how the images are connected in a lattice pattern with square pyramids as the individual unit. When viewing his works straight on, the three—dimensionality aspect of the works are lost and the subject is clearly seen. However, when viewing from different angles, the scene suddenly changes entirely. Ipkyu Jang is a korean born artist who received his Bachelor’s degree in environmental sculpture from the University of Seoul. He has since studied at the Kunstakademie Muenster of fine arts in Germany. Jang has participated in group exhibitions and held solo exhibitions in galleries and festivals in Korea and China. In 2008 he was accepted for the 4th art contest of Kyunghyang – shinmun. Sejun Lee received both his Bachelor’s and Master’s Degree in Fine Arts from Hongik University studying painting. Since 2009 he has showcased his work in galleries and museums in Korea and New York. His most recent solo exhibition “The Varieties of the Artistic Experience,” was on display at the Hongik Museum of Art in March of 2013. Lee has also participated in numerous Art Fairs including the Korea International Art Fair and the Popup Art Fair.